The game isn’t over. As of now, it’s 29 – 17, Colts leading, with just over 5 minutes remaining in the 4th quarter. The commercials this year didn’t impress me much. I’ll write about those later. 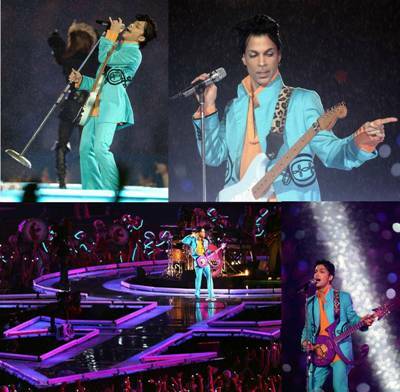 Here are some pictures of Prince during the Pepsi halftime show. I was quite pleased that he sang some of his old songs, including Purple Rain. A fitting song, given the weather at today’s game. Pretty soon the winning 15 second commercial will air. Tune in tomorrow for more on that, and the commercials as a whole. Prince won an Academy Awards for Best Original Score in 1985, for the score to the movie Purple Rain. Prince wrote the lyrics to the song “Manic Monday” that was released by The Bangles, under the pseudonym “Christopher”. The song went to #2 on the Billboard Hot 100. Prince gave Carmen Electra her stage name. Prince provided the soundtrack for the Spike Lee movie Girl 6 in 1996, under the name ‘Prince’. The only time that he used his name, not his symbol from 1993 through 2000. In 2006 Prince was honored with a Webby Lifetime Achievement award for his use of the Internet to connect with audiences. Prince opened his own nightclub and Jazz Cuisine at the Rio Hotel in Las Vegas in November 2006. He is a Jehovah’s Witness. previous post: Punxsutawney Phil Didn’t See His Shadow!